There is no shortage of contemporary research that has reported a strong relation between working memory (Gsm-MW) and g or Gf. Colom et al (in press) have added yet another article ("in press" in Intelligence) that continues to support this strong association. The article and abstract is below. The above figure (which is from the manuscript) is hard to read...I know. The important point to glean from the crude figure is the fact that in this study Colom et al. specified direct paths from both the latent short-term or memory span (STM) and working memory (WM) factors to g.
An alternative conceptualization, which I (based on the work of others) have presented elsewhere, hypothesizes that memory span (and Gs) have direct effects on working memory, which in turn, has a strong direct path on g. In the models I have presented, the effect of memory span (and Gs) are largely indirect (mediated via working memory). In addition, models that extend this work to the investigation of subsequent direct and indirect effects of memory span (Gsm-MS), Gs, and g on academic achievement have been presented. There are several studies showing that working memory and intelligence are strongly related. However, working memory tasks require simultaneous processing and storage, so the causes of their relationship with intelligence are currently a matter of discussion. 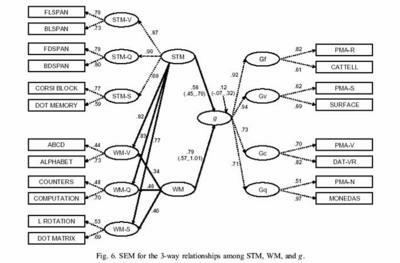 The present study examined the simultaneous relationships among short-term memory (STM), working memory (WM), and general intelligence (g). Two hundred and eight participants performed six verbal, quantitative, and spatial STM tasks, six verbal, quantitative, and spatial WM tasks, and eight tests measuring fluid, crystallized, spatial, and quantitative intelligence. Especial care is taken to avoid misrepresenting the relations among the constructs being studied because of specific task variance. 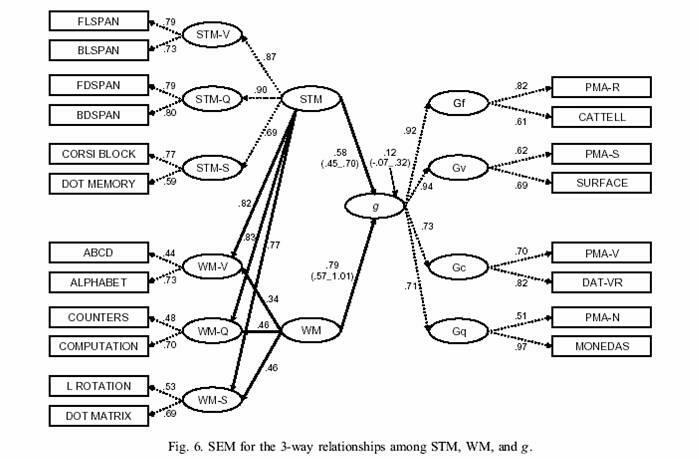 Structural equation modelling (SEM) results revealed that (a) WM and g are (almost) isomorphic constructs, (b) the isomorphism vanishes when the storage component of WM is partialed out, and (c) STM and WM (with its storage component partialed out) predict g.
Who said statistics are not useful? Glr-MA (associate memory) predicts Alzheimer's ? Superior and Gf - Parietal lobe importance? Video games, Gv and surgery? Gv-MV - "what/where" brain locations of MV? Searching the worlds library via Google? More different opinions on the "Mozart effect"